Rosemary Oil For Hair Loss - Does It Grow Thicker, Stronger Hair? Rosemary Oil For Hair Loss – Does It Grow Thicker, Stronger Hair? In Aromatherapy: An A-Z, frequently referred to as the “aromatherapy bible,” author Patricia Davis states unequivocally that rosemary oil’s usefulness for hair growth is nothing but a myth (1). Davis is a certified aromatherapist and instructor at the London School of Aromatherapy with two other bestselling books on the subject under her belt, thus she presumably knows what she is talking about. We also have Valerie Ann Worwood, noted aromatherapist, reflexologist, and physiologist, and author of her own encyclopedic tome, The Complete Book of Essential Oils & Aromatherapy. “Rosemary oil is an excellent treatment for hair loss. It stimulates cell division and dilates blood vessels, thereby stimulating the hair follicles into producing new hair growth” (2). The point is that the line between alternative medicine and quackery is frequently a contentious one, even among practitioners. This is not unique to the field of alternative medicine, however. After all, few if any fields exist where all the experts agree. Moreover, lack of universal agreement need not be off-putting or suggestive that there are no answers to be found. The intent of this article is not to declare who is right and who is wrong about the effectiveness of rosemary oil for hair growth. What are its claimed benefits? What type of hair loss is it supposed to be able to treat? Rosemary oil is an essential oil that has been extracted from the pine-like leaves of the rosemary plant (rosmarinus officinalis, to be precise) through a process of steam distillation. It has been widely used for centuries as a folk remedy for numerous health conditions. In modern times it has come into widespread use in food, cosmetics, and pharmaceuticals. Rosemary, like most medicinal plants, has an interesting history. The ancient Greeks and Romans referred to it as the herb of remembrance and fidelity, most likely based on their belief that it strengthened the memory. The Romans used it to decorate statues of their household gods and as a sacred incense in religious ceremonies. Egyptians also considered rosemary to be sacred, using it to prepare the dead for mummification. Traces of the herb have been discovered in the tombs of the Egyptian First Dynasty. It was also used in the Middle Ages to ward off evil spirits and protect against the plague. It has been said the in 1235 Queen Elizabeth of Hungary was cured of her paralysis after a hermit soaked a pound of rosemary in a gallon of wine for several days and then rubbed it on her limbs. 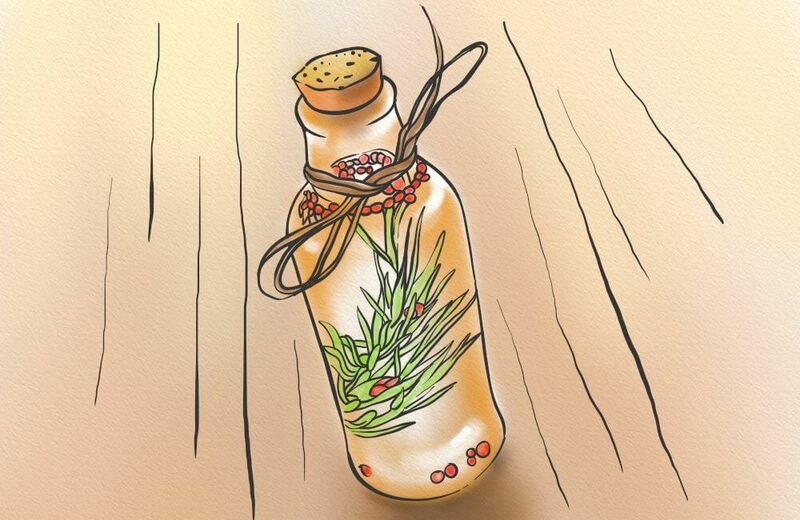 The combination of rosemary and wine thus became known in Europe as the Queen of Hungary’s Water. What Are Rosemary Oil’s Claimed Benefits? Rosemary oil is considered to be one of the most versatile oils used in alternative medicine. It has been described as containing a various of therapeutic healing properties including analgesic, antimicrobial, anticancer, antifungal, anti-inflammatory, and antioxidant properties. Due to these properties, practitioners use it to treat problems involving the central nervous system, cardiovascular system, reproductive system, respiratory system, digestive system, memory and brain function, genitourinary conditions, and liver problems. It is also used in many topical lotions and ointments for the treatment of ailments such as arthritis, gout, muscular pain, neuralgia, wounds, and stimulation of hair follicles for hair growth. To treat headaches, add a drop to your hands and use them to cover your mouth and nose for up to a minutes. This is also said to improve clarity of brain function. To improve learning and memory, diffuse the oil around the room, inhale from the bottle, rub over your temples, or apply to the toes regularly. As a mouthwash and to remove oral bacteria, mix with water and swish around in your mouth for thirty seconds a few times a day. To nourish the scalp and remove dandruff, add it to your shampoo or massage it into the scalp. What Type of Hair Loss Is Rosemary Oil Supposed to be Able to Treat? Rosemary oil is said to treat hair loss associated with alopecia areata, androgenetic alopecia, and other types of hair loss associated with scalp conditions. 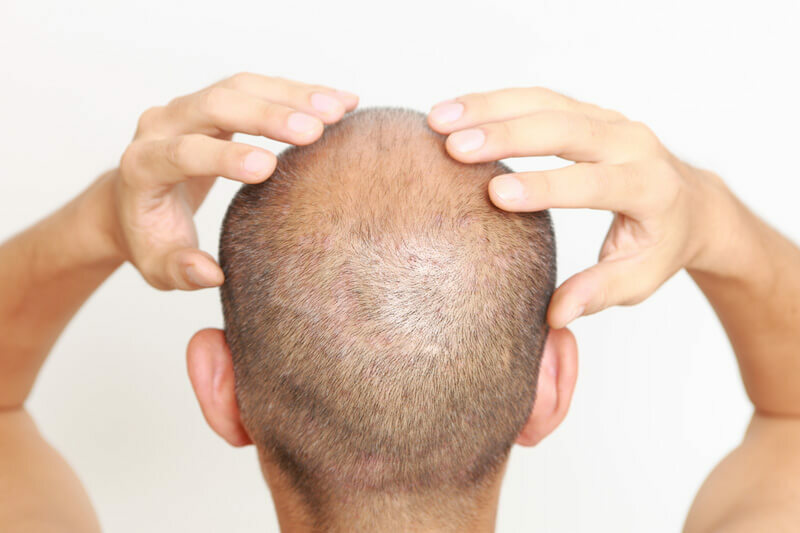 AA is an autoimmune disorder also referred to as spot baldness where the immune system mistakenly attacks hair follicles, causing the hair to fall out in patches. Doctors do not know what causes AA and it is not curable. Most people with AA will regrow their hair after a few months. Topical application of Rosemary Oil is said to treat AA by stimulating the hair follicles to support hair regrowth. AGA is a genetic condition also referred to as male pattern baldness, though it can affect both men and women. Find out about the 9 biggest causes of hair loss in women here. AGA is estimated to affect over 50 million adults in the US. It generally begins with hair loss at the temples, continues on around the crown, and eventually leads to total baldness. AGA is caused by a genetic predisposition. The main androgen believed to be associated with it is dihydrotestosterone (DHT). It is believed that when DHT levels increase in hair follicles, the hair’s growth cycle is shortened and new hair growth is delayed. Over time, the hair follicles completely stop growing new hair. The pharmaceutical treatment options for AGA are Minoxidil and Finasteride. Minoxidil, known commercially as Rogaine, is a topical treatment that stimulates the hair follicles. It has been shown to be moderately effective after 4 to 6 months of use. Finasteride, marketed as Propecia and Proscar, is a pill that works by binding to the enzyme (5-alpha-reductase) that would otherwise convert free testosterone to DHT. Topical application of rosemary oil is said to treat AGA by stimulating the hair follicles, like Minoxidil, and by inhibiting conversion of free testosterone to DHT, like Finasteride. Hair loss can also be caused by clogged hair follicles, dead skin build up and some scalp conditions that prevent hair regrowth. All of these types of hair loss are considered to be curable and treatable. Rosemary oil is known to have natural antifungal and antibacterial properties that help in maintaining a clean, healthy scalp and strong, healthy hair follicles. As such, rosemary oil could have a direct benefit in treating these types of hair loss. The chemical constituents of rosemary oil include bitter principle, resin, tannic acid, volatile oils, and flavonoids. The volatile oils consists of borneol, bornyl acetate, camphene, cineol, pinene, and camphor. All of these phytochemicals have scientifically proven health benefits. Scientific studies have also demonstrated that as a result of the presence of these phytochemicals in the rosemary plant, rosemary oil possesses anti-inflammatory, anti-microbial, anti-tumor, anti-ulcer, immune stimulant, and enzyme induction effects in vitro and in animals. Helps enhance cognitive function in Alzheimer’s patients. NOTE: The studies mentioned above consisted of essential oil blends, which included rosemary oil. The most relevant research related to rosemary oil as a hair loss treatment involves two key studies, one in the UK in 1998 and the second in Japan in 2012. In 1998 researchers at the Department of Dermatology, Aberdeen in the United Kingdom conducted a randomized, double-blind, controlled study lasting seven months to investigate the efficacy of topical application of essential oils as a treatment for alopecia areata. The essential oils used in the trials were thyme, rosemary, lavender, and cedarwood blended in a base of jojoba and grapeseed carrier oil. For the study, 84 subjects diagnosed with alopecia areata were randomized into two groups. The treatment group received daily scalp massages with the essential oil blend. The placebo group received massages using only the carrier oils. At the end of the trial, 44% of the subjects in the treatment group showed improvement, as compared to 15% in the placebo group. As a result, the researchers concluded that the essential blend used in the study was a safe and effective treatment for alopecia areata. Considering the blend was composed of various essential oils, it’s difficult to say what percentage of results can be contributed to each. However, it’s likely that rosemary oil did play a role in the results, due to its many chemical components mentioned previously. In 2013, researchers at Kinki University in Osaka, Japan showed that topical administration of Rosmarinus officinalis leaf extract (RO-ext) resulted in improved hair regrowth in mice that had experience hair growth interruption induced by testosterone treatment. The same researchers also looked into the antiandrogenetic activity mechanism of RO-ext to evaluate its efficacy for the treatment of androgenic alopecia. One of the effective strategies for treating androgenetic alopecia is through inhibiting the binding of dihydrotestosterone to androgen receptors. Thus, the researchers concluded that RO-ext was a promising treatment for hair growth in mice with Androgenetic Alopecia (AGA). This study is in contrast to another, more recent study published in Evidence-Based Complementary and Alternative Medicine in 2014 that investigated the efficacy of a different oil as a treatment for AGA. 3) The 2014 study involved ingestion of the oil as a supplement, not as a topical application. We mention this here to point out that the Kinki University study on rosemary oil is inconclusive in regards to its use on humans, and more research is needed. In 2015, researchers investigated whether rosemary oil could be just as effective as Minoxidil in the treatment of Androgenetic Alopecia. To do so, they compared the oil to 2% Minoxidil as used on study participants for a period of six months. They visited the research facility at the beginning of the study, and every three months afterwards for a period of six months. The results were monitored using a microphotographic assessment at baseline, three months, and six months. At the three-month mark, there was no significant hair growth recorded in either group. However, both groups saw significant improvement at the six month mark. There was no significant difference between these hair count amounts, which shows that rosemary oil and Minoxidil 2% were equally effective in treating AGA. As for side effects, the Minoxidil 2% group did experience a slightly increased risk. The main complaint was scalp itching, and incidences of other scalp conditions (such as dandruff and greasy hair) were negligible. What does this mean for sufferers of AGA? Well, it could mean that rosemary oil compares to Minoxidil 2% in terms of results. It also has less side effects, which may make it a more suitable treatment option for many people. Are you interested in more recent scientific evidence? 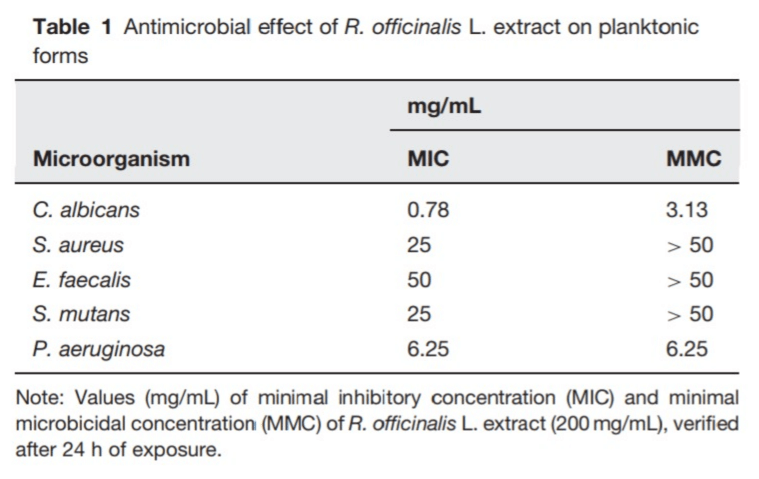 Researchers from Brazil analyzed the biological activities of Rosmarinus officinalis L. More specifically, they studied the effects it had on various microorganisms (including bacteria and fungi). Essentially, the researchers wanted to understand how rosemary oil interacts with a variety of organisms and the larger role in can play in human health. In the second part of the study, researchers wanted to determine the toxicity of rosemary extract on various living cells. In particular, carcinoma cells. When exposed to rosemary extract, the various cells were shown to decrease in viability. In some cases, it even dropped below 50%! Viability is the ability to work successfully, or otherwise thrive, within a host. When viability decreases, the cell is less likely to be able to function as it should. In terms of cancer cells, this means rosemary extract may be beneficial in decreasing their effectiveness. This isn’t to say that rosemary extract can fight cancer singlehandedly in living organisms, but it does show a natural ability to target them. Cytokines are proteins within the body that have pro-inflammatory effects. In other words, they lead to inflammation and pain when present within the different body systems. As noted by researchers (and as shown above), the production of two specific cytokines (IL-1b and TNF-a) was lower in the treated group than in the control. This shows that rosemary extract does have on the natural synthesis of cytokines and can, therefore, inhibit at least one source of inflammation. Finally, researchers considered the effect that rosemary extract could have on the DNA (genetic material) of a cell. This is known as genotoxicity, and it’s a measure of the extract’s ability to damage a cell’s integrity and increase the risk of mutations. To do so, researchers used a Micronucleus (MN) assay, which tracks the presence of micronuclei in a cell. These appear when the nucleus of a cell becomes damaged. 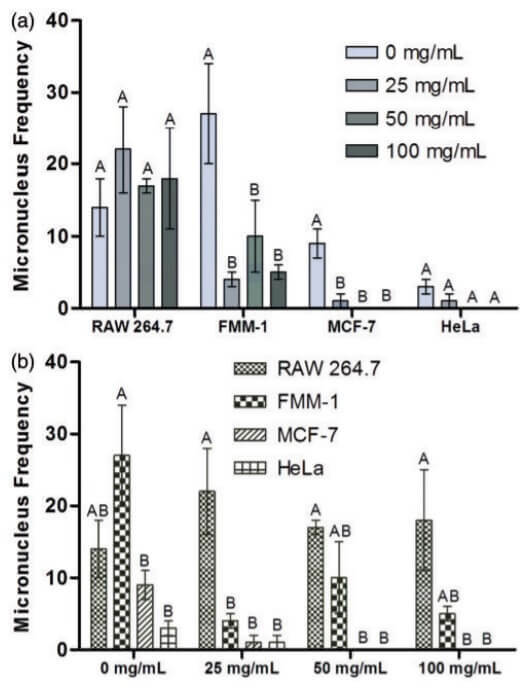 The assay was performed with four different cell types – RAW 264.7, FMM-1, MCF-7, and HeLa – and as shown above, the different concentrations had various effects. Overall, researchers determined that rosemary extract did not damage the nucleui and was, therefore, not genotoxic. Even further, rosemary extract seemed to have a protective effect on the cells. What Does This Mean for Hair Loss? While this particular study didn’t focus on rosemary’s effects on hair growth, it does shed light on a few of the oil’s benefits. 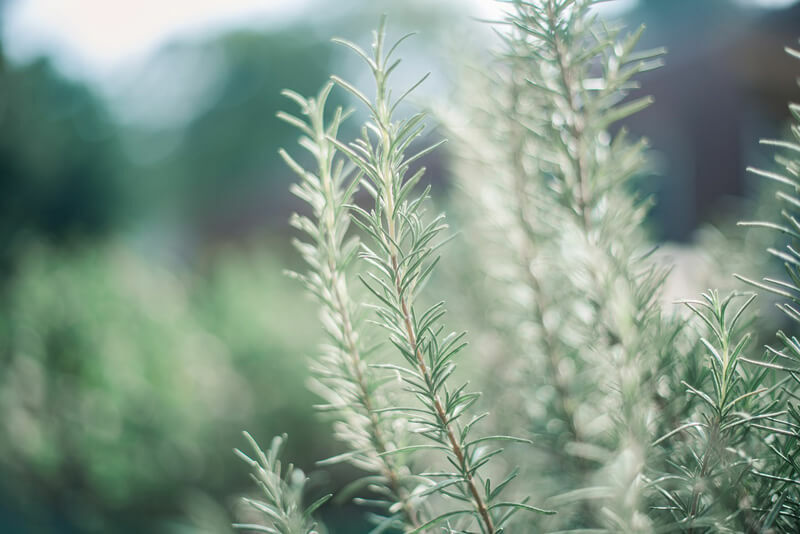 Foremost, rosemary extract was shown to have both antimicrobial and anti-inflammatory properties. This is beneficial for many types of hair loss, but especially Alopecia Areata and those related to scalp conditions (such as dandruff and seborrheic dermatitis). The study also shows that rosemary extract can target cancer cells, as well as protect cellular nuclei, though further studies must be done to understand its impact on other cell structures. What are Rosemary Oil’s Side Effects? According to the University of Michigan Health System (8) there are no well-known supplement or food interactions with this supplement. However, it is always possible that unknown interactions exist. If you take medication, always discuss the potential risks and benefits of adding a new supplement with your doctor or pharmacist. The Drug-Nutrient Interactions table may not include every possible interaction. Taking medicines with meals, on an empty stomach, or with alcohol may influence their effects. For details, refer to the manufacturers’ package information as these are not covered in this table. If you take medications, always discuss the potential risks and benefits of adding a supplement with your doctor or pharmacist. How Should Rosemary Oil Be Used? For treating hair loss, rosemary oil should be blended with carrier oils and massaged into the scalp daily. It can also be added to shampoos and conditioners for maintaining general hair and scalp health. With so many shampoos on the market that claim to give you healthy hair, it can be difficult to find the ‘right’ one. However, the majority of shampoos contain harmful chemicals (such as Sodium Laureth Sulfate (SLES) and Sodium Lauryl Sulfate (SLS)). And while these ingredients may preserve the shampoo, they can also damage your hair. You can search out all-natural shampoos, which tend to contain essential oils (such as rosemary). Or, you can create your own. Combine the above ingredients, and mix well. Lather onto wet hair, and massage into the hair and scalp for complete coverage. For best results, let sit on your scalp for 3 minutes. Then rinse with lukewarm (or cold) water. The ACV gently cleanses the scalp by removing excess sebum buildup. The rosemary and peppermint essential oils also cleanse the scalp, as well as soothe any irritation and increase blood flow to the area. Finally, the jojoba oil both moisturizes and hydrates the scalp and hair strands. This prevents hair breakage, and increases hair strength. Now, you’re probably wondering how much benefit this can really have. After all, you rinse it off within minutes of applying it. That’s why I recommend you also use your own, essential oil-infused conditioner. 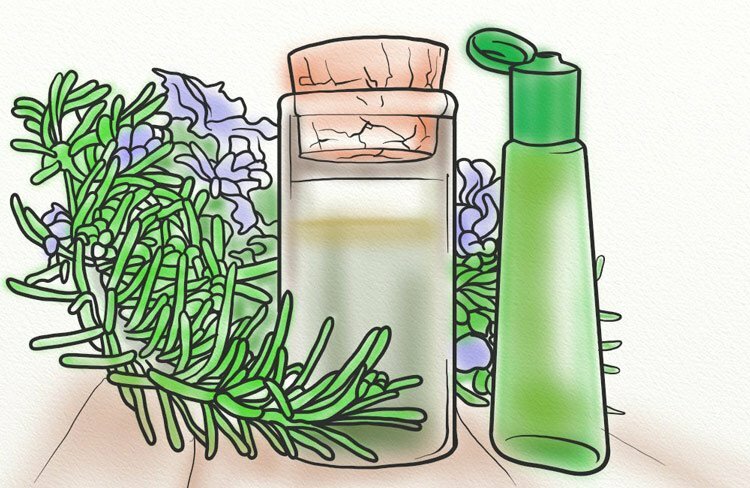 You can add rosemary oil to any store-bought conditioner, or even create your own. And the majority of conditioners can be left in for 20 minutes, or even overnight. If you want to receive the most benefit from rosemary oil, I recommend applying it directly to the scalp. This can be done at night, and even left on and rinsed off (with lukewarm water) in the morning. But first, let’s talk about dilution. Essential oils, including rosemary, are concentrated substances that need to be diluted before applying to the skin. Why? Their high concentration levels can cause skin irritation, and even chemical burns. So, how can you dilute rosemary oil properly? With carrier oils! Carrier oils are the oils you most commonly think of, such as olive and coconut. They act as a delivery system for the essential oils, and they also lessen their concentrations so as to prevent injury. I recommend 5mL of carrier oil for each drop of essential oil. Now that you’re ready to apply rosemary oil to your scalp, here’s the best way to do so. Pour the mixture of your chosen carrier oil and rosemary into your palm, and massage between your hands. Apply a thin layer on the scalp, and pay special attention to irritated and/or thinning areas. 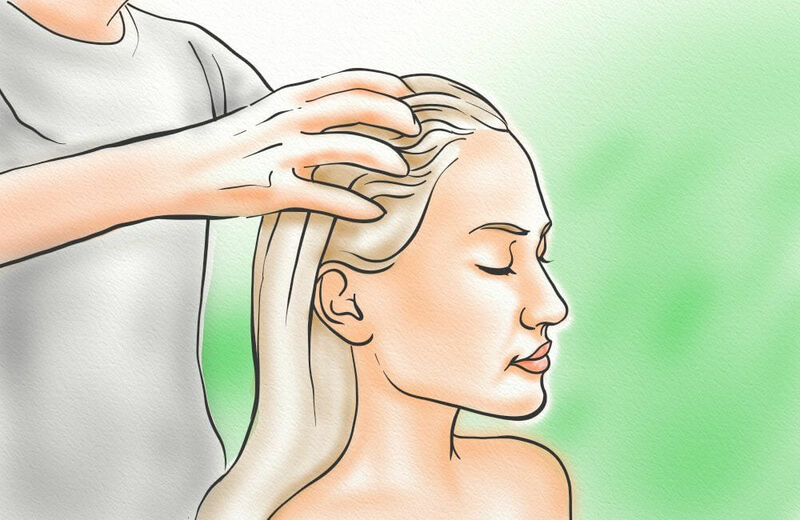 To increase both the delivery and effects of the oil, you can also combine this technique with scalp massage. First apply the oil to your scalp as described above. Then, place your fingers on either side of your head (above the ears) and move in a circular motion. Apply varying levels of pressure, and continue the circular motions across the entirety of your scalp. This is a great, natural way to increase blood flow to the scalp. It also reduces stress! Rosemary oil is available online and anywhere essential oils are sold. The price of pure, organic rosemary oil ranges from $.10 to $1.50 per milliliter depending on the brand. How would you recommend using rosemary oil on your hair to get started? Do you think it’s the best option or are there better alternatives available? Hi Jennifer, the best way to use it is to add approximately 15ml of essential oil to 200ml of magnesium oil. Along with this add another 15ml of peppermint oil. Every night before going to bed spray this mixture on to your scalp and gently massage in. Try to get it on the scalp not the hair, although it doesn’t matter too much. Then in the morning wash out with cool water. The other option is to add a few ml to a homemade shampoo. If you want to learn more about all of the essential oils that can help grow hair then I have an ebook on the subject covering all 18. I’d recommend checking it out by signing up to my emails. Hi HHi Hartfield, I’ve used minoxidil 2% for two weeks and my hair sheds crazy. I stopped use it 3 days and the trend continues. Do you think if I switch to the peppermint oil mix would help stop the shedding? Thanks a lot for help! It’s common for shedding to occur when you start and stop minoxidil. Using the peppermint oil mix can help to reduce the shedding. Hi will I have been following your blog for some time now and found it really useful.. I wanted to ask if I can mix rosemerry and peppermint oil with coconut oil instead of magnesium base? That could work, but the problem is, magnesium oil washes out easily and helps reverse scalp calcification which is very important. What’s the problem with using magnesium oil base? I would recommend checking out our minoxidil alternative, GRO2, which contains essential rosemary oil, plus other ingredients that are proven to help. I have no funds right now so my family bought me some rosemary oil, castor oil and lavender oil. Just wondering in a 2-ounce bottle how many drops of rosemary oil do I put in it? I really like your formula, unfortunately, with no job I can’t purchase it. So I am trying to make my own until I can get a job and be able to purchase yours. Hi Shannon, I would prefer if you use magnesium oil, rather than castor oil (I presume you’re using the castor oil as the ‘carrier oil’? Aim for about 5% essential oils to 95% carrier oils. Have I done any damage using rosemary oil straight to the scalp? Hi Tony, you definitely want to dilute it. Pure essential oils are very concentrated and for lots of people they will be too much and cause irritation. You can send me an email to will (at) hairguard.com. I’ve written it like that to avoid the spam bots. What about using rosehip oil instead of rosemary? Hi there, my suggesting is that a topical product alone won’t have a large effect on your hair. Having said that, why not choose both?